Last night, I was staring into my freezer and I had a sudden hankering for blondies. 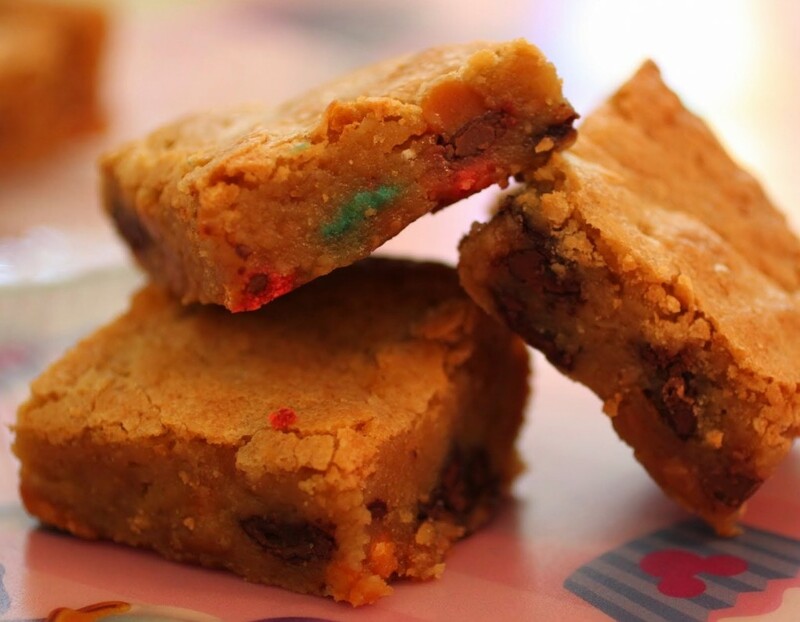 Really thick, chewy blondies with lots of goodies mixed in. 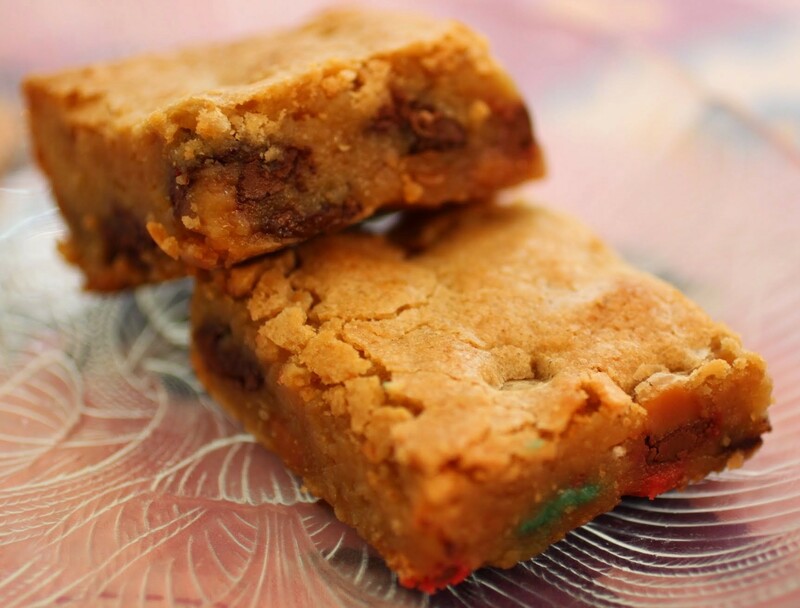 I grabbed the bags in my freezer, made up a batch of my favorite blondies, and threw all the candy in there. It was kind of therapeutic, actually. What better way to spend an evening than freely tossing candy into batter and eating some along the way while dancing to guilty pleasure music? I can’t think of anything more fun. 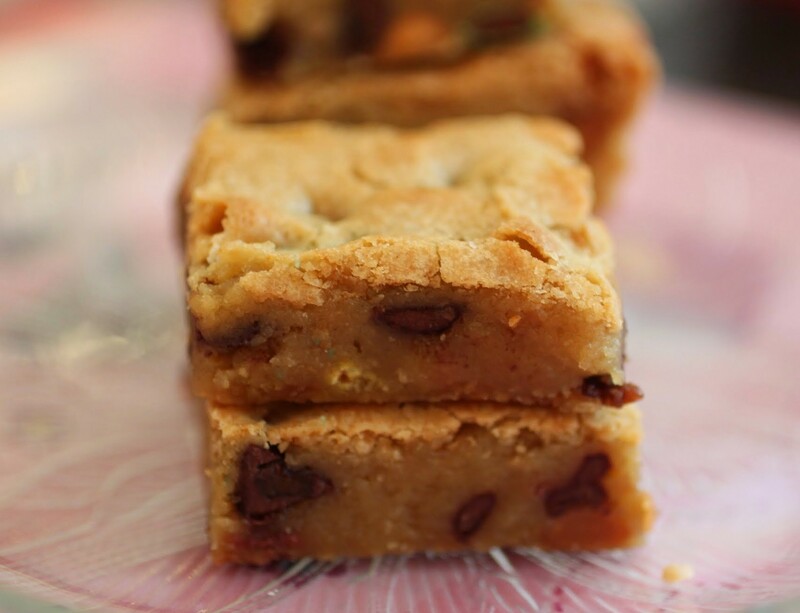 Especially when the blondies came out of the oven and I got to eat them! They were all that was promised. Thick. Full of stuff. 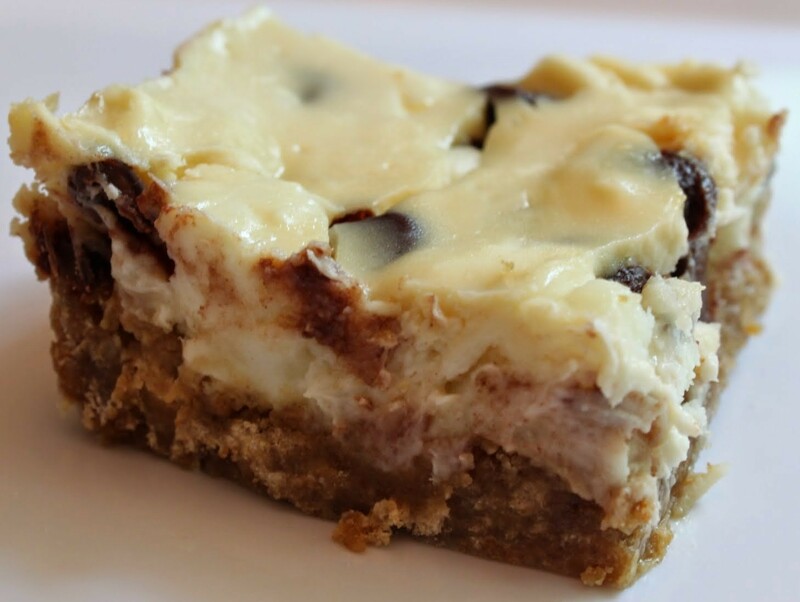 Sinfully irresistible, rivaling any bakery blondie I’ve ever had, and then some. Wow, that came out totally arrogant-sounding. Oh well. If I couldn’t bake, I wouldn’t be doing this whole blogging thing. The lesson here, my friends, is to use up what you have from time to time. Chocolate does go bad, so it’s vital to bake with it before that happens. You can’t just let it languish for months in your cabinets. Then when you try it and it’s all chalky, you’ll just be lost in the sadness. If you have different mix-ins at home, use those. I’ll list what I used in the recipe, but that’s just me. 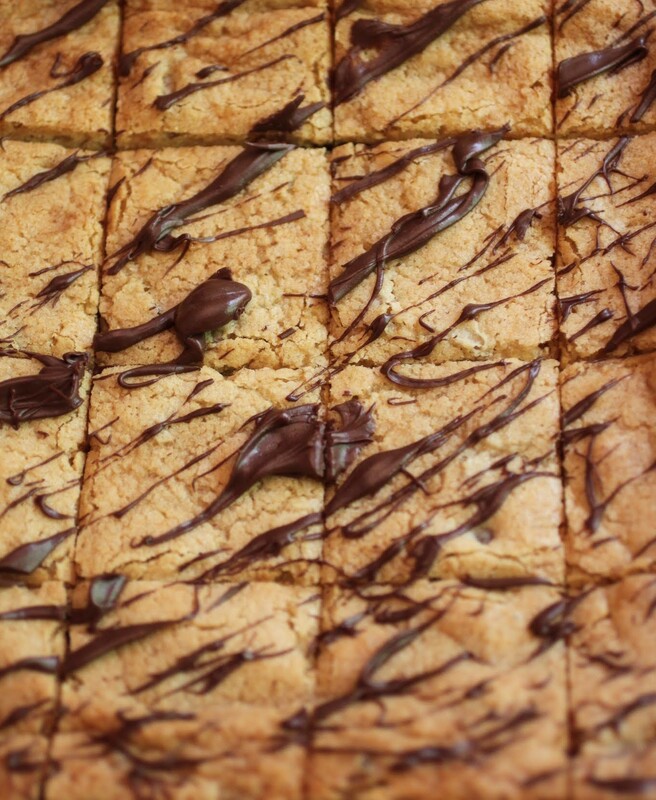 It’s important to realize that you can put your own mark on these blondies! Just make sure that the candy you put in is your favorite. Then everyone wins! Preheat the oven to 350. Line an 8 x 8 pan with foil, leaving enough to overhang the sides, and coat in cooking spray. Take a larger bowl and mix the brown sugar, melted butter, eggs and vanilla until just blended. Add the dry ingredients gradually and mix until incorporated. Fold in the candy. YES. 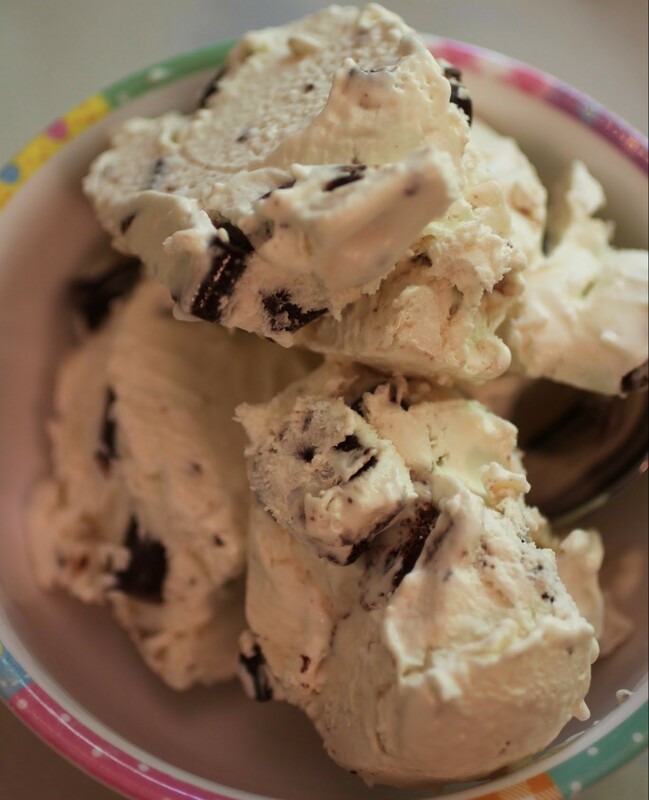 Freezer chocolate is pretty much the only way to go. And overloaded is the only way to do brownies. And brownies are synonyms with the weekend. I know what I need in my life 🙂 Hope you’ve had a wonderful one Mir! Mary Frances recently posted…All Things Fall Yâall Blog Hop + Giveaway! I did, thanks! Back to the grind now. But there are still blondies! I don’t keep my chocolate in the freezer, but maybe I need to start! I do love putting Girl scout’s Thin Mints in there, though! 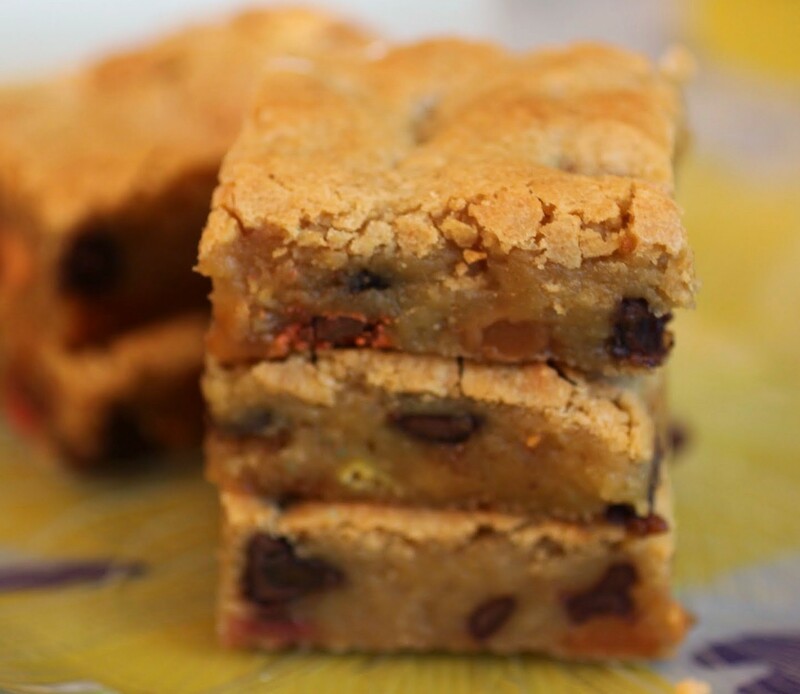 🙂 These blondies look delicious, Mir! 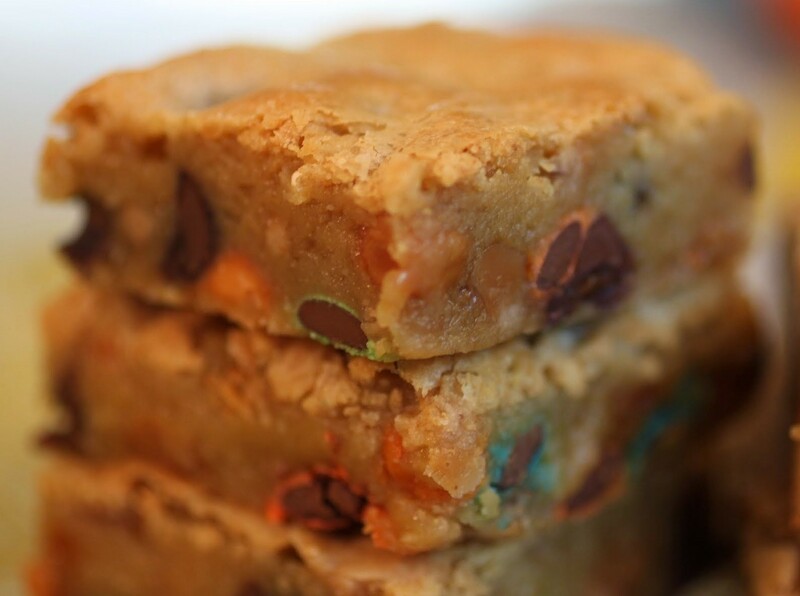 I love how thick and chewy they are, perfection! Try it, Gayle! It’s changed my chocolatey life. Especially if you like your GS cookies frozen. Great comfort food for our family!